Cottar’s 1920 Camp Safari tradition began in 1919. Almost 100 years on, they have provide an unparalleled safari experience to discerning guests in Africa. Extending an era of luxury and quality, the theme is to return to the original spirit and essence of ‘safari’, reminiscent of a golden era ~ an era of romance, professional guiding, adventure and elegance. 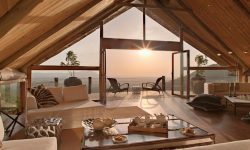 Situated in an untouched exclusive concession bordering the Serengeti, Maasai Mara and Loliondo reserves, the camp and the area guarantee privacy and an abundance of wildlife. 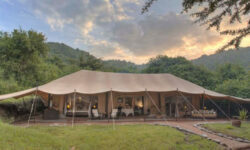 The camp accommodates up to 28 guests in authentic white canvas luxury tents. The camp spreads over 1 kilometre and has 2 mess tents, so guests are assured a spacious yet intimate environment. 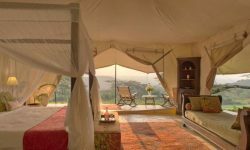 The tents include private en suite dressing rooms and bathrooms, main bedrooms and verandas, with family tents also having a living room with a fireplace. Cottar’s Private Homestead is designed for those that want absolute privacy combined with dedicated and discrete staff, award winning guides, and an abundance of wildlife, this Mara homestead offers the only real private luxury home in the Mara. The contemporary African style house can be rented only on an exclusive basis and comes with a dedicated staff of 8. The house has a large living room, a dining room, a magnificent viewing deck and 5 en suite bedrooms, all with stunning views, Game vehicle(s) and a dedicated guide are provided to guests throughout their stay. A 25m swimming pool sits in the grounds of the Private Homestead and is exclusively available to the Private Homestead.
. There is good phone signal at the Homestead and some areas in camp. A wireless phone is also available at a fee in the office.